Avidemux came in second place in our best Linux video editor poll. 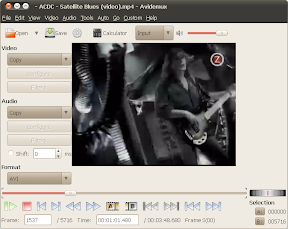 Although designed as a video editor, many people use Avidemux as a video encoder as well. Avidemux 2.5.3 is available @ GetDeb.net repository for Ubuntu 10.04 Lucid Lynx users only. If you don't have the GetDeb.net repository added to your sources.list simply download THIS deb package, install it and it automatically adds the GetDeb.net repository. For other Linux distributions, MacOS X and Windows, see the Avidemux download page.